From time to time I like to post a case study as an example of the implementation of all the good advice we’ve been giving the past 6 years. Tips and how to’s are great, but stories of implementation are like a picture being worth a 1,000 words. The following is a basic case study for SEO work performed on a portion of the PRSA site that is focused on PR and Communications Jobs. With over 32,000 professional and student members, the Public Relations Society of America (PRSA) represents the world’s largest organization for PR professionals. 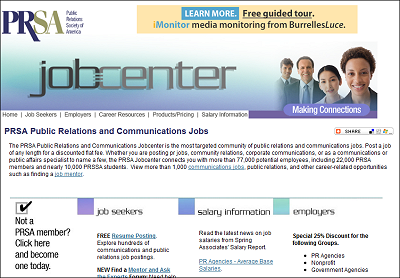 One of the key resources PRSA offers to its members is the PRSA Jobcenter, where over 77,000 potential employees are able to connect with a seemingly infinite number of public relations professionals. PRSA made the decision to upgrade the architecture of the PRSA Jobcenter, with the objective of improving both traffic via search engine visibility and overall usability for its members. As a component of its existing search engine optimization and consulting program, PRSA engaged TopRank Online Marketing to improve the usability and search engine visibility of its Jobcenter. A SEO Audit was conducted to identify target market keywords, opportunities for code level optimization, crawling and indexing issues as well as content that would meet the needs of candidates searching for specific types of PR and communications jobs. A keyword glossary of popular and relevant terms was reconciled with the available content on the web site and recommendations were made to update pages, tags and links where necessary. Part of those recommendations were to create job category pages that offered specific information on the top job searches on the PRSA Jobcenter. RSS feeds for each category were created and promoted, allowing job seekers to subscribe and receive automatic updates. A variety of link building tactics including the use of a widget to populate other web sites with PRSA powered job listings provided direct traffic and a useful signal to search engine crawlers that other topically relevant web sites considered the PRSA Jobcenter worth linking to. The Jobcenter site optimization edits and new job category pages provided targeted content for the search engines and also created a seamless connection between the employers job listings and job seekers. Clustering popular phrases by category and subsequent content pages proved useful for search engines and for searchers. Ongoing training of PRSA staff on keyword usage in new document creation as well as link building helped the client, “help themselves”. Within the first six months of implementing the SEO audit and new category pages, total traffic to PRSA’s site has increased substantially, while pageviews for PRSA’s Jobcenter increased by over 40% and continues to climb. Search engine rankings and visitor referrals from competitive keyword phrases increased substantially. For example, referrals from queries on the #1 Google ranking keyword phrase ‘public relations jobs‘ have increased by over 450%. The goal of making Public Relations and Communications job listings posted to PRSA’s Jobcenter more easily found via search directly affected the ability to promote PRSA over competitors. “The SEO team at TopRank has been a tremendous partner for improving the search engine visibility of the PRSA Jobcenter. Their work with keyword research, content optimization, code SEO and link building has been instrumental to growing a key business for our organization. I recommend TopRank’s SEO consulting services without reservation.” – William Murray, President and COO, Public Relations Society of America (PRSA). With case studies like this, there’s a lot more than what meets the eye as far as SEO tactics. Many SEO consultants have very sophisticated knowledge for improving rankings and traffic. Fewer have the insight and patience to deal with legacy content management systems, different levels of approval, interdepartmental cooperation and ongoing education of client staff. What’s not mentioned above and I’ll mention here is the importance of talented and experienced Account Management. The best SEO advice in the world is useless unless it’s properly implemented. The key to getting recommendations implemented and for those changes to stay implemented is a relationship between agency account team and the client side people involved. That includes marketing, PR, business managers, content producers, IT and often times, Legal. Thank you so much for the PRSA Jobcenter case study! When you're embarking on something new, like an SEO campaign, it can get frustrating if you don't start to see results immediately. Seeing case studies that show successful implementations of things you're trying to do is definitely a huge boost of confidence. It's also always interesting to see what others did and why they're successful. No, but thanks for the recommendation. I was wondering on Doing SEO for Job boards website with this article i have come to know some great tips for optimizing some Giants in Search Engines. I was really worried about the things if the website not perform well in search engines and the marketing strategies failed to get huge traffic. Thanks for sharing this, it’s always fun to see how other SEO approach a project. Great job! Great job, that's WAY more helpful than almost anything I've read… got the juices flowing for some projects I'm working on. THANKS! hi every i really like your post many knowledgeable information in this site and every articles in this site really very nice thanks for share it.